« Military brain-chips to cure psychiatric disorders? Lucia Sommers of the Department of Family and Community Medicine at UC San Francisco commented on my last post, noting that clinical uncertainty among primary care physicians (PCPs) is usually regarded as tolerable at best. She was delighted that I called such uncertainty intellectually attractive, and something to embrace in psychiatry. Sommers and her coauthor John Launer recently published a book that argues for managing clinical uncertainty in primary care using “collaborative engagement with case-based uncertainty in the setting of small groups of clinicians.” This contrasts with medicine’s tradition of practitioners working independently. In her comment, Sommers asked me to describe how psychiatrists manage clinical uncertainty, and specifically whether “supervision” — cases “presented for discussion to at least another psychiatrist if not a small group,” similar to what she advocates for primary care physicians — is a good strategy in my experience. This post is my response. At its most fundamental level, human psychology exists to manage uncertainty. Confronted with an incomprehensible, threatening world, the infant soon differentiates “good” from “bad.” Initially a crude split without nuance or shades of gray, this primitive psychological distinction, second only to distinguishing “self” from “other,” represents a huge step forward. It sets the stage for approach versus avoidance — the first “management” the infant undertakes. Further psychological development allows subtler gradations to improve upon this harsh dichotomy. Developmental psychology describes how secure attachment with caretakers, and an increasingly stable sense of self, contribute to tolerance of uncertainty. With normal development, and under most circumstances, we no longer cling desperately to sharp black-or-white categories. We make finer distinctions, and can also tolerate degrees of uncertainty. Adult development takes this process further. Mastery of an academic or occupational field solidifies a stable professional identity, which contributes to comfort with uncertainty. Many years ago I learned a type of computer programming from my friend, an accomplished software engineer. I felt anxious when confronted with programming challenges: Would I fail to discover the solution? Waste long hours trying? Feel stupid in the end? In contrast, my friend felt no such anxiety. He explained that even when he was uncertain how to solve a problem, he knew he soon would, or at least would soon recognize it was impossible. He was able to wrap his arms around the whole field in a way I could not. Uncertainty for him no longer carried implications of permanence, nor of personal failure, i.e., narcissistic injury. It wasn’t threatening. In this frame of mind, a programming challenge is merely a puzzle, an engaging intellectual pursuit which can even be fun. Although the stakes are higher, the same applies in medicine. An intern faced with clinical uncertainty shares my erstwhile self-doubt as a beginning computer programmer. Is my uncertainty humiliating? A sign of failure? Will I ever figure it out? With more experience comes confidence that uncertainty isn’t psychologically threatening. It’s an intellectually engaging puzzle, often with a gratifying emotional reward at the end. In specialties such as primary care and psychiatry, uncertainty becomes the norm. We get used to it, expect it; we realize it doesn’t tarnish us individually. An additional factor that may sound esoteric but is crucial to thriving in uncertainty is the flow state. Variously described as being “in the zone” in sports, “centered” in Eastern meditative and martial arts practices, and “in the groove” in musical performance, this is a mental state of heightened awareness, engagement, and creativity accompanied by a relative lack of self-consciousness and conscious intent. Whether in extreme sports, music improvisation, video gaming, or academic brainstorming, moment-by-moment uncertainty is less disruptive and feels more welcome in the flow state. Although uncommon in typical medical practice, the flow state can arise during intimate discussion with a patient, during research activities, and when intensely absorbed in medical work-up or treatment planning — the very times when clinical uncertainty is actively addressed. Peers are a good source of emotional support whatever one’s level of expertise. Seeing that a problem is inherently difficult is reassuring; its apparent difficulty does not reflect on oneself. Social interaction bolsters self-esteem, and often humor is shared to defuse fear and anxiety. Similar challenges shared by others promote camaraderie and a sense of being “all in the same boat.” And tales of challenges successfully overcome can instill optimism, and sometimes offer practical solutions for the problem at hand. My own experience with psychiatric supervision is hierarchical, not peer-to-peer. Supervisors model a great deal non-verbally and often unintentionally: our attitudes toward patients and their issues, the focus of clinical attention, our approach to formulating cases, levels of formality and informality, and so on. The supervisor’s engagement with clinical uncertainty is one such factor, sometimes discussed explicitly, more often modeled non-verbally. Ideally, this role-modeling inspires and encourages supervisees to nurture clinical curiosity, and to avoid frantic efforts to resolve uncertainty with premature conclusions. Having not read the Sommers/Launer book, I cannot comment on their rationale for “collaborative engagement with case-based uncertainty in the setting of small groups of clinicians.” Psychologically, such collaboration is apt to confer the benefits of peer support mentioned above. In addition, it is often more fun and energizing to work as a team, although teamwork can be frustrating at times too. As a practical matter, putting multiple brains to the task may resolve clinical uncertainties more quickly and/or accurately compared to a practitioner working alone. Alternative tactics for resolving clinical uncertainty include consulting with recognized experts and conducting literature searches. 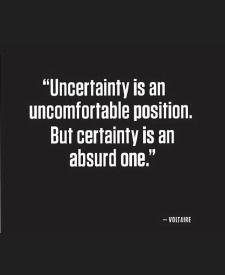 In my experience, psychiatrists manage clinical uncertainty by accepting that uncertainty is inherent in the field. It is therefore not a source of shame or a sign of personal inadequacy. Released from these emotional burdens, we are free to be curious, to keep an open mind, and to enjoy uncertainty as a puzzle to be solved, an engaging intellectual challenge. Relatively unstructured dialog in psychotherapy may particularly induce flow states in both participants, with enhanced capacity to accept and work with uncertainty during the hour. And finally, while many office-based psychiatrists practice individually, social support from peers, supervisors, and treatment teams can enhance comfort with clinical uncertainty. I have every reason to believe the same holds true in primary care. Good points all around and a great quote from Voltaire. I have known some really great docs who decided not to go into psychiatry because of the uncertainty associated with the prediction of suicide and violence. I think they generally minimize the uncertainty in the rest of medicine or perhaps think the methods of other specialists can resolve the problems quicker than things happen in psychiatry. There is also a cognitive element that goes along with being an expert. You can recognize patterns and complete them in your area of expertise based on your actual experience. That conscious property can resolve problems faster but it can also produce the recognition of a pattern of uncertainty that is familiar and one that does not call for an urgent resolution. Interesting article. How to you work with a patient who is fully aware of the fact that there is something different with their neuropsych/ emotional functioning and that doctors have not seen it before? If I see a new doctor I explain that their is some unusual wiring going on and that it is OK that they don’t know what it is. My experience is that sometimes the docs can get angry at themselves because they can’t figure it out and then show their own internal frustration to the patient. As a patient it can be hard because your have to juggle your own frustrations as well as the doctors. It is hard as a patient to see the pain/panic on your doctors face when they see your hurting and they don’t know how to stop it. There can be guilt on both sides of the table. A big part of the usual doctor-patient paradigm is that the doctor will successfully diagnose and treat the patient. Failure to do this may scare or anger the patient. And the doctor can be very self-critical. Telling the doctor there “is some unusual wiring going on and that it is OK that they don’t know what it is” is very helpful. It indicates you won’t be disappointed or angry if there’s no instant answer. Of course, the doctor may still be self-critical. It’s a matter of degree. You wouldn’t want a doctor who didn’t care at all about doing a good job, and on the other hand, you wouldn’t want one who is so perfectionistic that the diagnostic riddle overshadows the actual patient. I don’t think there’s anything else you can do as a patient (except find a doctor who isn’t rattled by uncertainty). We doctors must find the sweet-spot where we aim to do a good job, but we don’t poison the patient’s experience with our perfectionism. Personally, I find curiosity to be the secret ingredient. Instead of focusing on success or failure, focus instead on how interesting the problem is. As mentioned in the original post, lots of experience in one particular domain helps insulate one’s ego from the task at hand. Thanks for writing. Thanks for the reply, very kind of you. I don’t understand how a patient can get angry at a doctor who has the confidence to say that they do not know what is causing a patients difficulty. I am sure it happens all of the time in countless offices and to those docs I am truly sorry. I feel for today’s doctors. The curiosity that you state is a secret ingredient is not a billable code. As a patient with a quirky brain (might be a code for that) I appreciate all of the docs who think outside of the box and try and enjoy the art and science of medicine while working hard to make a living.